Search marketers are a busy bunch always seeking more data, insights and control over the results we deliver. Raven Tools VP Taylor Pratt knows all about how to harness the power of SEO, social media and advertising tools to increase traffic and conversions for small business and Fortune 500 company websites. On January 26th, 2012 Taylor educated the Minnesota Search Engine Marketing Association (MnSearch) event attendees about both new and long-established tools that search marketers in-the-know should consider integrating into their practices. 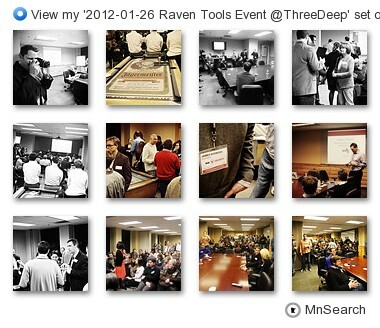 On the day of MnSearch’s inaugural event the venue was packed after we “sold out” of tickets within a few days. We enjoyed the company of 100+ search marketers at all levels of experience joining us from boutique agencies to large companies. The thirsty crowd networked for the first hour over tasty beverages and snacks provided by our generous event sponsor Three Deep Marketing. Many attendees had the opportunity to rub elbows with Taylor after his presentation and he chatted with the most passionate and dedicated search marketers well after 9 PM. 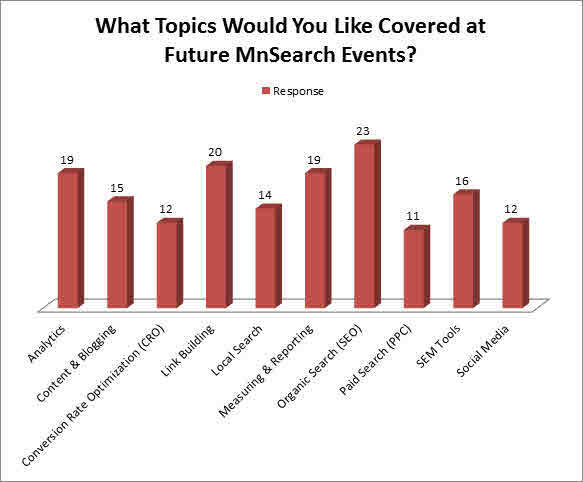 Below you may find coverage and mentions of MnSearch’s inaugural event and event survey results. The MnSearch board thanks our attendees for their support and involvement. Feedback about MnSearch’s inaugural event was overwhelmingly positive and we hope to keep an upward trend. We asked registered event attendees to let us know what to cover at our upcoming search marketing events. Our dedicated board is here to serve MnSearch’s existing and potential members so when survey results showed SEO and link building at the top of the list Events Director Aaron Weiche delivered! On Tuesday, April 24th MnSearch hosts “Why Every Marketer Needs a New Link Building Strategy” with nationally known speaker Arnie Kuenn, Vertical Measures President from Phoenix, AZ. The event will be held at the Day Block Building in Minneapolis, MN. Hope to see you there!